Born a slave in Philadelphia, Richard Allen and his entire family were sold to a Delaware plantation owner in the 1760s. At the age of 17, Allen began attending weekly Methodist Society meetings that transformed his life. By the age of 20, Allen was able to purchase his freedom and he became an itinerant Methodist preacher. The preaching circuit allowed him to attend Methodist meetings throughout Delaware, Maryland, New Jersey, and Pennsylvania. 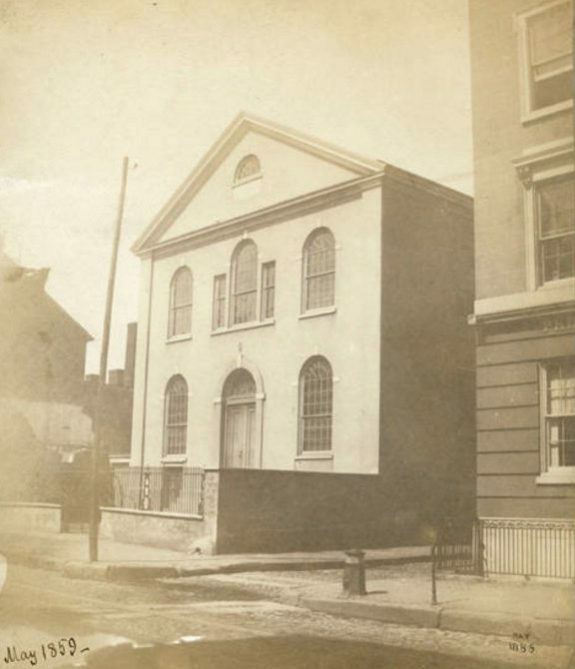 In 1786 Allen accepted an offer to be a weekly speaker at St. George's Methodist Episcopal Church in Philadelphia. 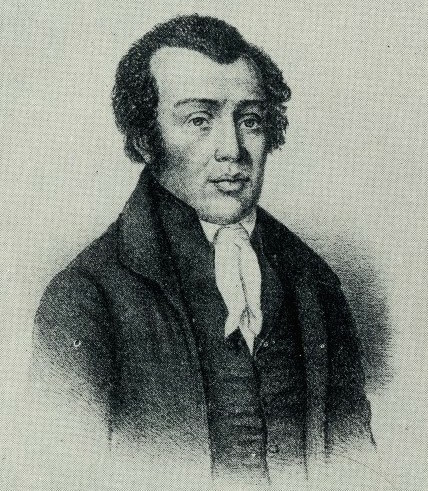 Allen used his role as a Methodist religious leader to support abolitionism and to assist the swelling African American community in Philadelphia from the 1780s through the1830s. Absalom Jones was born into slavery in Delaware in 1746. As a boy, he served in the home of his master, Benjamin Wynkoop, and taught himself to read using the Bible as a resource. In 1762, Wynkoop decided he’d rather be a merchant than a farmer, so he sold several slaves, including Absalom’s mother and siblings, and moved to Philadelphia. There, Absalom continued to serve Wynkoop as a handyman and clerk. At night, whenever he was not working in the shop, Absalom attended a school for blacks run by Quakers. At the age of 23, Absalom married another slave named Mary, who was owned by Wynkoop’s neighbor. The couple worked hard and saved the little money they were permitted to earn and after eight years, they were able to buy Mary’s freedom. It would be another six years, however, before they could buy Absalom’s freedom as well. Once free, Absalom adopted the last name Jones and before long, Jones had become a leader in Philadelphia’s black community. Despite the religious activities undertaken by the Free African Society, its adherents remained as worshippers at St. George’s Methodist Episcopal Church until the early 1790s. Although St. George's was primarily a white church, its African American audience was steadily growing, largely due to the tremendous drawing power of Richard Allen’s weekly sermons. With their numbers rising–and with tensions rising with white congregants–Richard Allen and Absalom Jones and other blacks began fund-raising and petitioned Methodist elders to create a distinct black church. Their designs were denied, and confrontation was inevitable. When whites at St. George’s attempted to push blacks to segregated seating and physically bar them from kneeling in prayer during a Sunday service, Allen and Jones led black parishioners in a walkout. Three black congregations originated from this historic act of protest. Black congregants who remained at St. George’s were soon allowed to meet separately and would formally organize African Zoar Methodist Church, a Methodist satellite, in 1796. Allen broke away from the society, and some members followed him to become members of Bethel African Methodist Episcopal (AME) Church, founded in 1794. Others preferred to associate with the Episcopal (formerly Anglican) denomination–founding St. Thomas’s African Episcopal Church, with Jones as their leader. 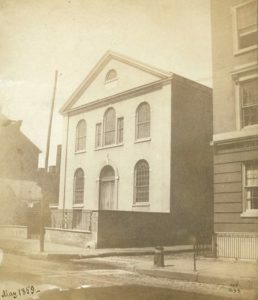 This photograph, taken in 1859, depicts the African Episcopal Church of St. Thomas at its original location at Fifth and Adelphi Streets (now St. James Place). Today, the congregation meets at 6361 Lancaster Avenue. Ultimately, the nondenominational nature of the Free African Society combined with tensions between black and white parishioners at St. George’s Methodist Episcopal Church to bring about a schism that led to the founding of three distinct African American congregations. Some blacks preferred to associate themselves with the Episcopal (formerly Anglican) denomination–founding St. Thomas’s African Episcopal Church, with Absalom Jones as their leader in 1794. Black congregants who remained at St. George’s were soon allowed to meet separately and would formally organize African Zoar Methodist Church, a Methodist satellite. 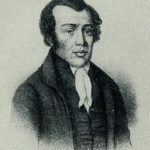 For his part, Richard Allen, who believed deeply in the Methodism’s antislavery bona fides and its virtues of plain living and speaking, was committed to establishing an independent Methodist church. In 1794, he broke away from St. George’s and from the Free African Society. Some members followed him to become members of Bethel African Methodist Episcopal (AME) Church. 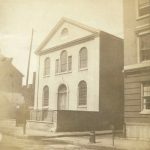 The original Bethel Church was dedicated in July 1794 on land at Sixth and Lombard Streets that Allen had purchased in 1791. As the congregation grew, new, larger churches were built. Bethel's fourth church, dedicated in October 1890, stands here at 419 S. Sixth Street. In 1953, the word "Mother" was added to the name of this Bethel Church. The building is a National Historic Landmark with a congregation in 2106 of about seven hundred. Headed by black founding fathers Richard Allen (1760-1831) and Absalom Jones (1746-1818), the Free African Society was founded on April 12, 1787, as a nondenominational mutual aid society and the first dedicated to serving Philadelphia’s burgeoning free black community. Members contributed one shilling per month to fund programs to support their social and economic needs. 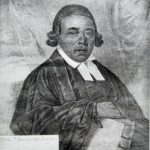 The Free African Society emerged from discussions among Allen, Jones, and other men in early 1786, when Allen was leading prayer meetings and early-morning services for black congregants of St. George’s Methodist Church. Concerned that the majority of Philadelphia’s black community was illiterate and did not go to church, these men decided to form a nondenominational, religious society to promote religion and literacy, as well as assisting members’ families to help cover the costs of burial after a member’s death. To join the Free African Society, prospective members agreed to pay the monthly dues and to abide by moral requirements to be temperate and refuse to engage in disorderly behavior. Members of any religious denomination could join, but anyone who behaved in disorderly ways, abused alcohol, or did not pay their dues faced expulsion. By demanding that members abstain from feasts, drinking, and gambling, the society’s officers sought to combat beliefs that blacks were lazy, disorderly, or frivolous—claims often deployed as a justification for slavery. They also argued that indulgence in the “sins” of drinking, gambling, or idleness showed a lack of respect for blacks still enslaved. Members in good standing could expect a number of benefits from the mutual aid fund. Particularly in the first years of the society, important aspects of support for members included payments for burials and providing financial aid for widows and other family members of the deceased, finding apprenticeships for children to learn a trade, and paying tuition for members’ children if places in free schools were not available. Over time, the society expanded to care for the social and economic well-being of its members by providing moral guidance, by helping newcomers to the city feel welcome, and by giving assistance during periods of financial difficulty brought on by unemployment or sickness. The society also took on the task of assisting the sick during the yellow fever epidemic in 1793. Members nursed the sick, dug graves and buried the dead, and transported the ill to quarters outside of the city where they could be quarantined and given medical aid. Ultimately, the nondenominational nature of the Free African Society brought about a schism that led to the society’s demise. Allen, a Methodist, became disillusioned with the society’s reliance on Quaker principles such as observing fifteen minutes of silence before meetings or having a committee visit members’ houses to ensure they were living morally. In 1794, Allen broke away from the society, and some members followed him to become members of Bethel African Methodist Episcopal (AME) Church, founded in the same year. After Allen’s departure, the remaining members of the society gravitated toward Absalom Jones’s African Episcopal Church of St. Thomas, where many of the remaining members began to worship. Though the Free African Society was not particularly long-lived, it spurred the creation of many similar African American mutual aid societies, more than one hundred in the Philadelphia region by 1838. The society’s mission of community building and assisting one another also contributed to the self-sufficiency of Philadelphia’s growing free black community. Not only did the churches founded by Jones and Allen become cultural and religious centers of the community, but free blacks also began moving to the neighborhoods around the churches, close to shops, businesses, and schools operated by former members of the Free African Society. Elise Kammerer is a Ph.D. candidate in American history at the University of Cologne, where she specializes in free black education in early national Philadelphia and the antislavery movement in the eighteenth and nineteenth centuries. Berlin, Ira. “Slavery, Freedom, and Philadelphia’s Struggle for Brotherly Love, 1685-1861.” In Antislavery and Abolition in Philadelphia: Emancipation and the Long Struggle for Justice in the City of Brotherly Love, edited by Richard Newman and James Mueller, 19-41. Baton Rouge: Louisiana State University Press, 2011. Douglass, William. Annals of the First African Church, in the United States of America, Now Styled the African Episcopal Church of St. Thomas. Philadelphia, 1862. George, Carol V. R. Segregated Sabbaths: Richard Allen and the Rise of Independent Black Churches, 1760-1840. New York, London and Toronto: Oxford University Press, 1973. Nash, Gary. Forging Freedom: The Formation of Philadelphia’s Black Community, 1720-1840. Cambridge, Mass., and London: Harvard University Press, 1988. Newman, Richard. Freedom’s Prophet. Bishop Richard Allen, the AME Church, and the Black Founding Fathers. New York and London: New York University Press, 2008. Winch, Julie. “Self-Help and Self-Determination: Black Philadelphians and the Dimensions of Freedom.” In Antislavery and Abolition in Philadelphia: Emancipation and the Long Struggle for Justice in the City of Brotherly Love, edited by Richard Newman and James Mueller, 66-89. Baton Rouge: Louisiana State University Press, 2011. Winch, Julie. Philadelphia’s Black Elite: Activism, Accommodation, and the Struggle for Autonomy, 1787-1848. Philadelphia: Temple University Press, 1988. Mother Bethel African Methodist Episcopal Church. “Records, 1822-1972.” 25 microfilm reels. Historical Society of Pennsylvania, 1300 Locust Street, Philadelphia. 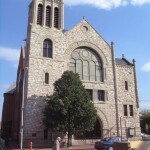 Richard Allen Museum at Mother Bethel AME Church, 419 S. Sixth Street, Philadelphia. 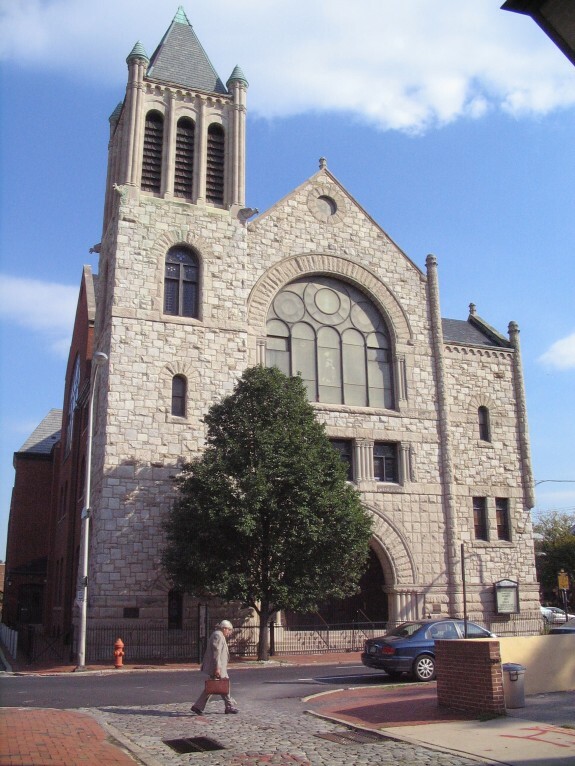 African Episcopal Church of St. Thomas, 6361 Lancaster Avenue, Philadelphia.